How can I create a custom jig to hold a skateboard for laser engraving? Because of their large work area and laser-friendly material, skateboards are becoming a fast favorite for custom engraving. 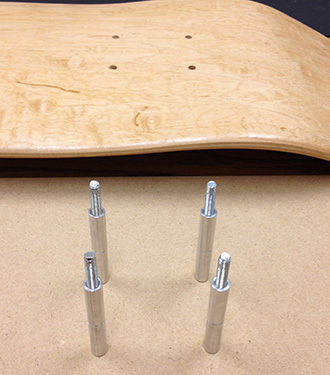 While the task can seem a bit challenging, we'll show you how, with just a few supplies from your hardware store you can create a very useful jig that will hold your skateboard in place during the engraving process. This valuable tool will also allow you to locate the center of the skateboard for perfect artwork alignment each and every time. 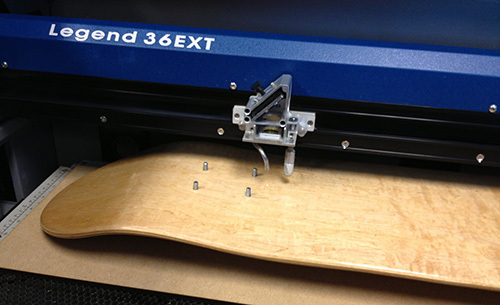 Epilog Legend 36EXT - this project requires a larger bed size. Measure the skateboard truck holes and the distance between the truck hole sets. 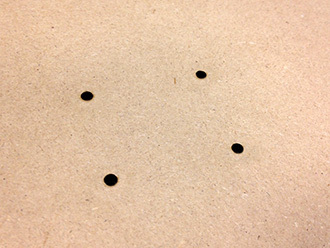 Start by measuring the distance between the truck holes in the skateboard - measure from the center of the holes. Then measure the distance between the two sets of truck holes. Distance between trucks = 14"
Create a template for the truck holes using the measurements from Step 2. 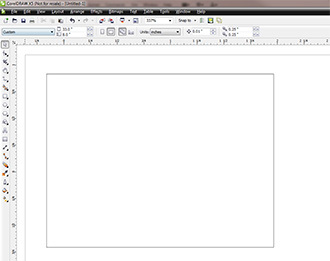 Using CorelDRAW, create a new page that is 33" by 8" (the same size as the skateboard jig.) 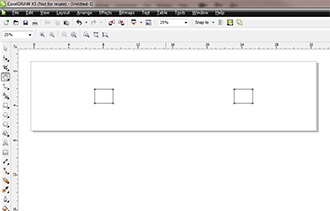 Using the Rectangle Tool, create a rectangle that is 2.125" wide and 1.625" tall. Create a second set of truck holes. 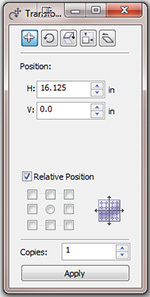 Now we are going to create a duplicate of the rectangle using the Position Palette in the Transformation Tools section. Open the Transformation Palette, Window / Dockers / Transformations / Position. 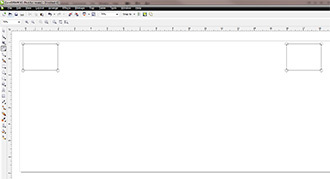 Enter 16.125 in the Horizontal Position dialog box, and 1 in the Copies dialog box (pictured to the right). The boxes need to be 14 inches apart from the inside edges, so we added 14 and 2.125 to get our final measurement. A visual representation is included below. 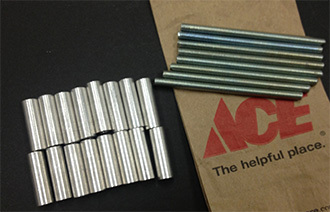 A #10 threaded rod is 0.190" in diameter, so we need to laser cut the holes just a bit smaller than the rods. Create eight circles, each 0.175" in diameter. Set the outline size to hairline, and place each of the circles on the corners of the two boxes. Align the center of each circle on the corners of each of the rectangles, (pictured below and to the right). Once you're finished placing all the circles, group both sets of rectangles and all the circles. Select the two sets of truck holes and center them on the page by choosing Center to Page in the Arrange > Align and Distribute drop-down menu, or by pressing P.
Then Ungroup all of the holes and rectangles, and delete the rectangles. Select all of the holes and print to the laser using the settings suggested in the manual. We used a 120-watt 36EXT at 20% speed and 60% power. Screw in the rod and barrel standoffs. First, thread two of the barrels on to each rod, then simply screw the rods into the board. Once you're finished be sure to screw the barrels down so they are snug against the board (pictured to the right). To find the center point of the skateboard jig, use a ruler and a pencil and draw a line from the center of the top left inside standoff to the center of the inside bottom right standoff, then repeat the process from the top right inside standoff to the bottom left inside standoff. Where these lines intersect is the center point of the skateboard jig. Now you can expand your operation to engrave custom skateboards with consistent results every time!